Heat the oil in a wok or large deep skillet, over low heat for 1 minute. Meanwhile shred the cabbage fine. Add the cabbage and stir fry 4 minutes. Add sesame seeds and stir fry 1 minute more. 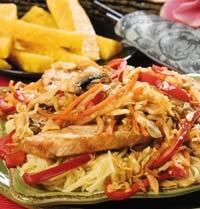 Add teriyaki sauce and toss ingredients until cabbage is tender but still crisp.